These little pickups are going for a bath! When most working guitarists experience a glitch or two with their instrument, they rely on their tech or hometown luthier to solve the problem. But if you're Slash, and your Number One guitar is really acting up - and you're sure the issue is electrical - you go to the source. That's right, you go to Seymour Duncan, as in himself. "The pickups - Duncan Alnico Pros - were what I would call 'subbornly microphonic,''" says Scott Olson from Seymour Duncan. "Through so many gigs and various weather conditions while traveling, on stage, whatever, Slash wore out the wax potting. They were exposed, and they were starting to squeal." 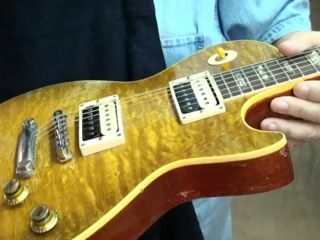 The bridge pickup, according to Olson, was "the more problematic of the two, and it needed more work. But through careful analysis, cleaning and rewaxing, Seymour "brought it and the neck pickup to their original condition. "If everything is still in working order, once you stabilize the components, you can work wonders," he says. "And that's what happened here. All in all, it was a very happy ending. Slash was thrilled at the results."